(Nanowerk News) If a mobile phone rings during a meeting, its owner often has to dig it out before it can be muted. A more discreet method would be to decline the incoming call by pressing on one of your fingers. Computer scientists at Saarland University are studying the potential use of the human body as a touch sensitive surface for controlling mobile devices. They have developed flexible silicone rubber stickers with pressure-sensitive flexible sensors that fit snugly to the skin. By operating these touch input stickers, users can use their own body to control mobile devices. Because of the flexible material used, the sensors can be manufactured in a variety of shapes, sizes and personalized designs. The research team will be presenting the ‘iSkin’ project from March 16th to March 20th at the Cebit computer expo in Hanover (Stand E13, Hall 9). The stickers are skin-friendly and are attached to the skin with a biocompatible, medical-grade adhesive. Someone wearing a smartwatch can look at a calendar or receive e-mails without having to reach further than their wrist. However, the interaction area offered by the watch face is both fixed and small, making it difficult to actually hit individual buttons with adequate precision. A method currently being developed by a team of computer scientists from Saarbrücken in collaboration with researchers from Carnegie Mellon University in the USA may provide a solution to this problem. 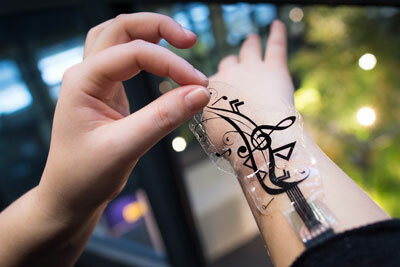 They have developed touch-sensitive stickers made from flexible silicone and electrically conducting sensors that can be worn on the skin. The stickers can act as an input space that receives and executes commands and thus controls mobile devices. Depending on the type of skin sticker used, applying pressure to the sticker could, for example, answer an incoming call or adjust the volume of a music player. ‘The stickers allow us to enlarge the input space accessible to the user as they can be attached practically anywhere on the body,’ explains Martin Weigel, a PhD student in the team led by Jürgen Steimle at the Cluster of Excellence at Saarland University. The ‘iSkin’ approach enables the human body to become more closely connected to technology. Users can also design their iSkin patches on a computer beforehand to suit their individual tastes. ‘A simple graphics program is all you need,’ says Weigel. One sticker, for instance, is based on musical notation, another is circular in shape like an LP. The silicone used to fabricate the sensor patches makes them flexible and stretchable. In addition to controlling music or phone calls, the iSkin technology could be used for many other applications. For example, a keyboard sticker could be used to type and send messages. Currently the sensor stickers are connected via cable to a computer system. According to Steimle, in-built microchips may in future allow the skin-worn sensor patches to communicate wirelessly with other mobile devices. The publication about ‘iSkin’ won the ‘Best Paper Award’ at the SIGCHI conference, which ranks among the most important conferences within the research area of human computer interaction. The researchers will present their project at the SIGCHI conference in April in Seoul, Korea, and beforehand at the computer expo Cebit, which takes place from the 16th until the 20th of March in Hannover (hall 9, booth E13).